The Post in its last issue comes out against the Governor’s call of the convention. This creates no surprise with the people of Montana, when the fact is considered, that if the people are allowed the opportunity, that the party which the Post represents will stand a poor chance of retaining the offices which they now hold. The Post endeavors to scare the people out of the notion of a convention, by overstating the expense of running a State Government. It will require, they say, “two hundred thousand dollars” to run a State machine—the writer makes his calculation upon a Republican basis—and that is to fleece the Government and people out of every dollar they can. It will not require a dollar more to run a State government than it does now to run the Territory, under Republican rule. Everybody knows that the great depreciation in Territorial scrip, is owing to the improper issue of it by order of the Republican officials, who have saddled Montana with a debt that taxes the capital and industry of the people with burdens hardly to be borne or submitted to. Every honest man in Montana ought to pray fervently and work diligently to get rid of the officers who have taken advantage of their official positions to fleece from the people their hard earnings; and the only way to do it, is to get in the Union as a State, and take the control of affairs in their own hands. After resuming his position as Montana Territory’s Secretary of State for nearly a year, Meagher disappeared during the summer of 1867. Whereas, it has passed, Almighty God to take from us by accident our esteemed friend, Secretary (late acting Governor) Thomas Francis Meagher, who was drowned at Fort Benton on the night of the 1st inst., by falling from the steamer G.A. Thompson. 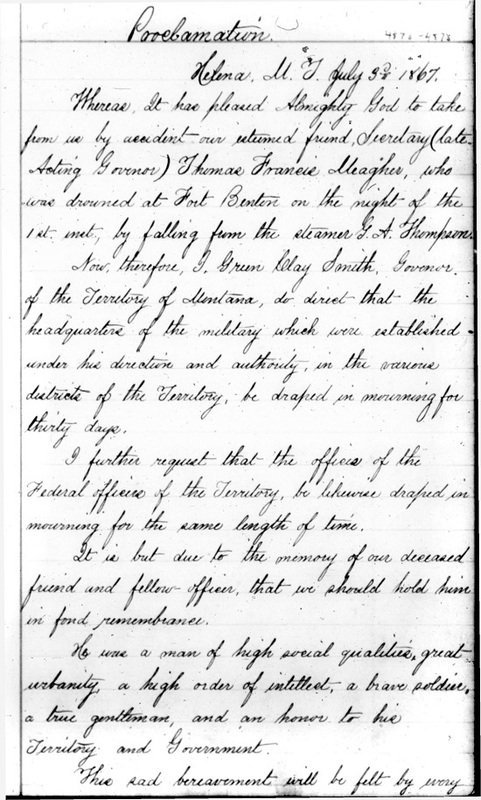 Information having been received by me that the body of General Thomas Francis Meagher has not been recovered from the Missouri river; and it being desirable that the same should be done in order to proper and Christian burial. You, therefore!, I, Green Clay Smith, Governor of Montana, do offer a reward of one thousand dollars for the recovery of the said body, and its safe delivery at Fort Benton…or [an]other of the military forts on the Missouri river where it can be preserved by friends. Meagher’s body was never recovered. James Tufts (1829-1884) became acting Governor of Montana Territory during Governor Green Clay Smith’s planned absence of a “month or two”. The letter transferring executive duties from Smith to Tufts for what would become a yearlong vacancy is also found in this release. 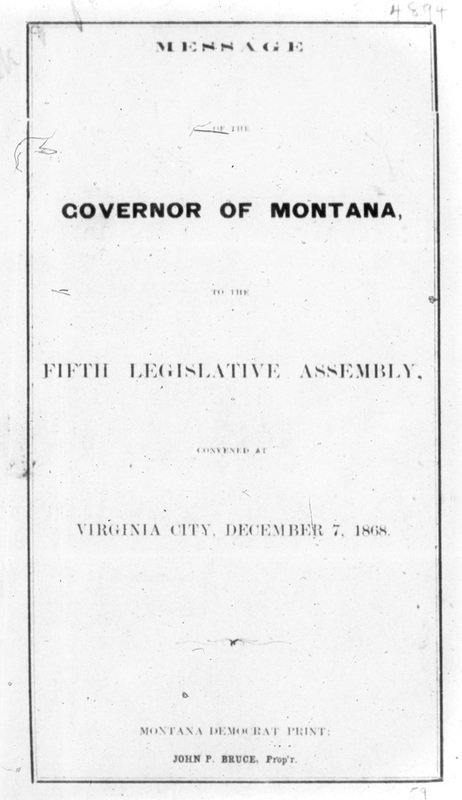 On December 7, 1868, Tufts carried out one such duty, delivering the Governor’s Message to the Legislative Assembly of Montana. After discussing public schools and the University of Montana, a historical society, criminal justice, railroads, and various other territorial affairs, the Governor directs the legislature’s attention to immigration. On a thoughtful consideration of the various inducements which our Territory offers to emigrants and the numerous channels through which labor here may be profitably distributed. I am satisfied that we need at the present time some more efficient means than we now possess for making our resources known abroad. Our country is capable of sustaining and affording profitable and constant employment to a population of half a million. Of the thousands of immigrants to America from Northern Europe, especially from the Scandinavian countries, a large number, by a well directed effort, could be induced, every year, to seek a home in Montana. The advantage to our Territory of introducing this class of the laboring population of Europe, need only to be illustrated by remarking the success of similar experiments in Wisconsin, Iowa, and Minnesota. No more industrious, well-behaved, thrifty citizens have settled in those communities. Ready to adapt themselves to all the resources and demands of new countries, with courage to endure, and the patient toil to overcome all privations, they soon, by affiliation, are [illegible] among us, and know no interests separate from our own. They are [illegible] in our valleys and among our mines, and wherever else in our Territory there is labor to be performed. The presence of this hardy and industrious race among us would soon dispense with any further demand for the services of the Mongolians, now so fast multiplying upon us. Our labors in this regard should be pursued at the great depot in New York City.